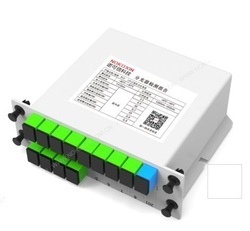 Offering you a complete choice of products which include fiber optic faceplates ftth, fiber optic termination box ftth faceplate, terminal plc splitter box gfs23-tx16a smc, terminal box gfs23-txpa32a, terminal box gfs23-txpa16a and terminal box gfs23-txpa08/16. Material: high quality ABS (flame retardant polycarbonate) material, has a certain fire resistance. * The dimensions of the panel correspond to national standards of type 86. * For SC or LC duplex adapter installed, used in the workspace subsystem. * Material: high quality PC (flame retardant polycarbonate) material, has a certain fire resistance. Suitable for installing and using the SC, FC, E2000 adapter; The maximum fiber capacity is 4 cores. Install and use the SC, FC and E2000 adapter are suitable for wall mounting and rack mounting. 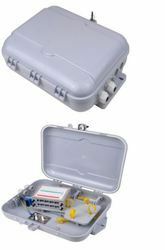 Applications: optical fiber communication systems, fiber access networks, LAN, optical fiber sensors excellent, optical fiber data transmission, CATV fiber, test equipment. 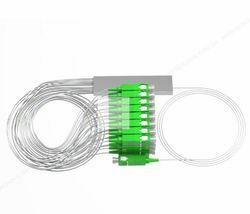 Optical fiber distribution and splitting box is composed by cabinet body, splicing tray, splitting module and accessories. The body is made of high quality SMC. The box has two layers. The outer layer is composed with mounting unit for splitter and cable management parts. 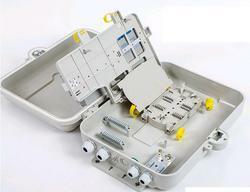 The inner layer is equipped by splicing tray and cable storage unit for pass-though riser cable. Modularized structure without jumping fiber, It may expanse capacity flexibly by increasing splitter installed module. The body is made of high quality ABS+PC plastic. 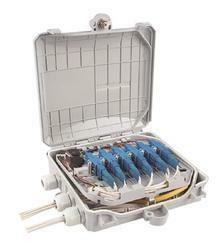 Outdoor fiber optic distribution box is available for the distribution and terminal connection for various kinds of optical fiber system, especial suitable for mini-network terminal distribution, in which the optical cables,patch cords or pigtails are connected, PC plastic terminal box, 2 input cable ports2 output cable ports, PLC splitter can be loaded inside, suitable for indoor and outdoor wall-mounted and pole mounted using. Repeatability Good inter change ability,repeatability and resistance. Repetitiveness Good inter change ability,repeatability and resistance. Description Feature 1. High accurate dimension. 2. Good inter change ability,repeatability and resistance. Fiber flange SC/APC singlemode fiber optic adapter . 2. Good inter change ability,repeatability and resistance. 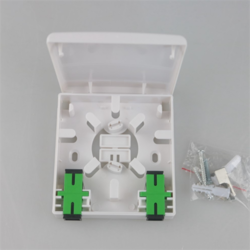 FC-FC O Ptical F Iber Coupler Typically used to connect two fiber optic cables with standard FC connectors (male). A fiber optic device capable of connecting one or more fibers in order to permit the transmission of light waves in several ways. The device is able to combine two or more inputs into one output and also to divide one input into two or more outputs. 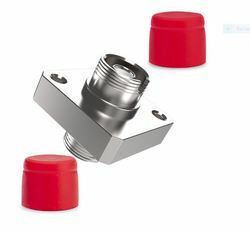 Compared to the connection or connector, the signal can be more attentive to fiber optic couplings. As an input signal, it can be divided between output ports. There are many benefits to using fiber optic couplings. They have low excess loss, high stability, double working window, high reliability and low polarization depend on loss. They also have high directivity and low insertion loss. Many applications use fiber-optic cables, such as antenna networks, optical communications systems, and fiber-optic technology. Planar lightwave circuit(PLC) splitter is a type of optical power management device that is fabricated using silica optical waveguide technology. It features small size, high reliability, wide operating wavelength range and good channel to channel uniformity, and is widely used in PON networks to realize optical signal power splitting. provides whole series of 1×N splitter products that are tailored for specific applications. All products meet GR-1209-CORE-2001 and GR-1221-CORE-1999 requirements. 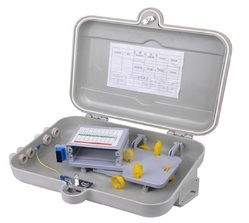 This Series plastic fiber optic distribution box is used for the distribution connection of cable and fiber optic communication devices. It leads out the optic signal from drop cable to pigtails by splicing in the box. 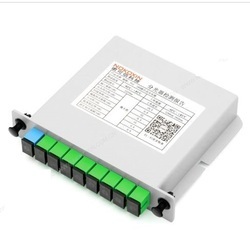 It can be used for protective connection of cable and layout pigtails, and fiber optic terminations of optic access networks. It is suitable for outdoor, corridor, weak current silo or collection points of villas, for the splicing, storage and distribution of local cable. 1. It is good for storage of fixing cable achieves. 2. 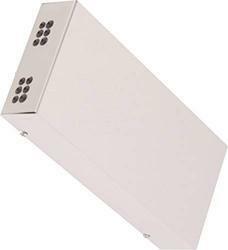 It is applicable for (indoor and outdoor) (pole-mounted, wall-mounted). 3. 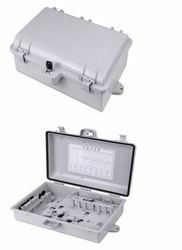 The splicing part is convenient for protection and maintenance engineering. 4. Adapter baseboard and optical installation box baseboard uses a rotary design. 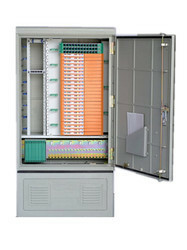 Cross connection cabinet is used for connecting trunk and distributing optical fiber cable. 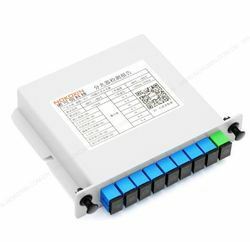 It carries out the function of splicing, storage, and distribution. 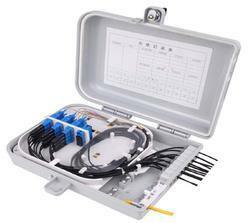 It is mainly used in the CATV, telecommunication equipment room and network equipment room. Easy to operate and convenient maintenance. · The body using the SMC or stainless steel and surface using electrostatic spray so it has good corrosion resistance and anti-aging function, the wind protection class of the body achieves the IP66 level. The effect of defense dewing is excellent. · The module tray can spin out of 90 degrees around the axis in the left front, and the bevel of the adapters within the module takes on 30 degrees. The clip-locked installation ensures the bending radius of the fiber directly and prevents the eyes from injury. 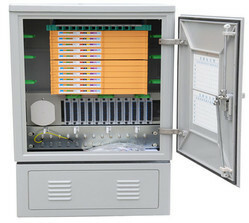 1. cross connection cabinet Widely used in FTTH (Fiber To the Home) access network. Cabinet keys; Plastic expansion screw, Self-tapping screws; Hose clamps, Shrinkable sleeves, etc. 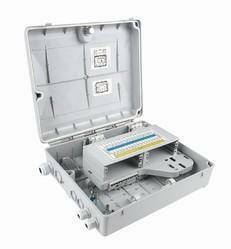 FTTH Fiber Socket is specially designed for FTTH (Fiber to The Home) for indoor application. Flexible termination methods: splicing + pigtail, mechanical splice + pigtail, fast connector on site. 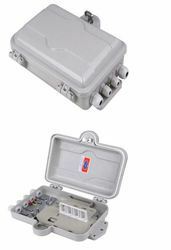 Outdoor fiber optic distribution box is available for the distribution and terminal connection for various kinds of optical fiber system, especial suitable for mini-network terminal distribution, in which the optical cables,patch cords or pigtails are connected, PC plastic terminal box, 2 input cable ports 32output cable ports, PLC splitter can be loaded inside, suitable for indoor and outdoor wall-mounted and pole mounted using. 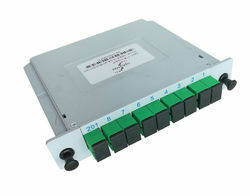 Can accommodate 1x8 & 1X16&1x32 PLC splitter. Up to 16FTTH drops. Wall and pole mountable. Can accommodate 1x8 PLC splitter. 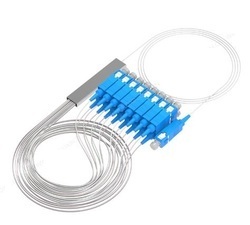 Up to 12 FTTH drops. 1. Light weight, high strength, epoxy electrostatic spray, beautiful appearance, easy to use. 2. The welding plate adopts a superimposed structure, which is flexible in configuration and can be taken down to the work table for welding, which is convenient and quick to operate and maintain. 2. When installed in the movable floor or on the ground, it should be fixed in the junction box. The information panel is in the form of upright and horizontal. 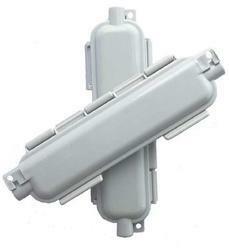 The junction box cover can be opened and should be waterproof, dustproof and pressure resistant. The junction box cover It should be flush with the ground. 4. The fixing method of the cable terminal box base should be determined according to the specific conditions of the on-site construction. It can be installed by means of expansion screws, nails, etc. 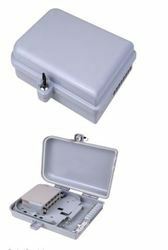 The fixing method of the information module bottom-mounted box is determined according to the construction site conditions. telecommunication equipment room and network equipment room. The body using the SMC or stainless steel and surface using electrostatic spray so it has good corrosion resistance and anti-aging function, the wind protection class of the body achieves the IP66 level. The effect of defense dewing is excellent. The module tray can spin out of 90 degrees around the axis in the left front, and the bevel of the adapters within the module takes on 30 degrees. The clip-locked installation ensures the bending radius of the fiber directly and prevents the eyes from injury. 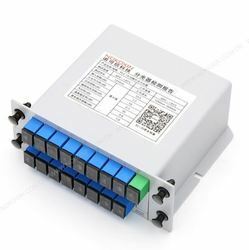 Planar lightwave circuit(PLC) splitter is a type of optical power management device that is fabricated using silica optical waveguide technology. It features small size, high reliability, wide operating wavelength range and good channel to channel uniformity, and is widely used in PON networks to realize optical signal power splitting. Nokoxin provides whole series of 1×N splitter products that are tailored for specific applications. All products meet GR-1209-CORE-2001 and GR-1221-CORE-1999 requirements.